I’m sure that this is an old optical illusion, but I haven’t seen it yet. I thought it was a pretty cute one, so I thought I’d share. 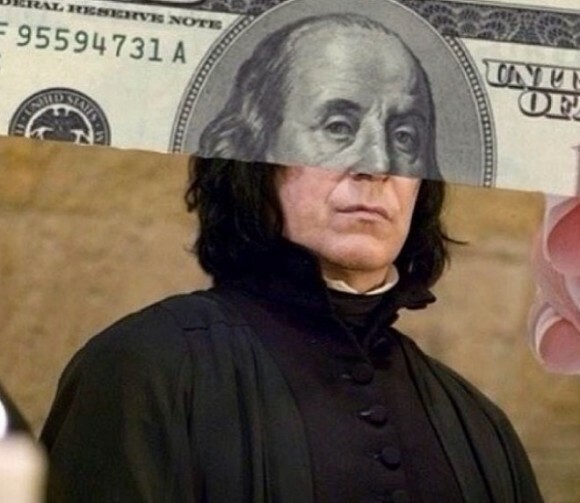 I give you the Severus Snape hundred dollar bill! I never really got into the whole Harry Potter craze and neither did my kids, but I did love Alan Rickman, the actor who played Professor Snape in the Harry Potter movies. He was probably one of my favorite actors. If the Severus Snape hundred dollar bill is right up your Diagon Alley, be sure to also head over and check out these cool library ad riddle illusions!